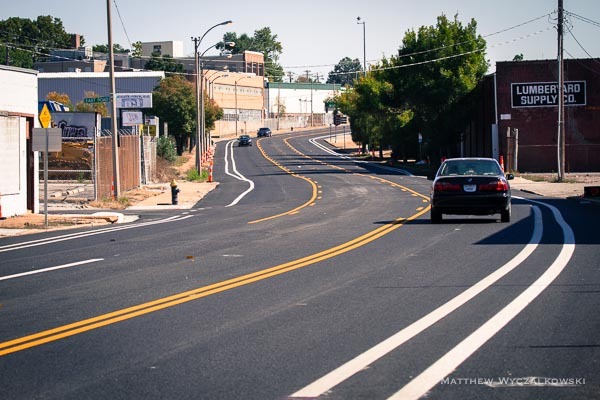 Manchester Avenue has been repaved and restriped from Vandeventer to the City Limits past McCausland, and there are significant new bike lanes along this stretch. The project is not quite done – bike arrows were missing, for instance – but the bulk of the layout is in place. Detailed plans can be found here. 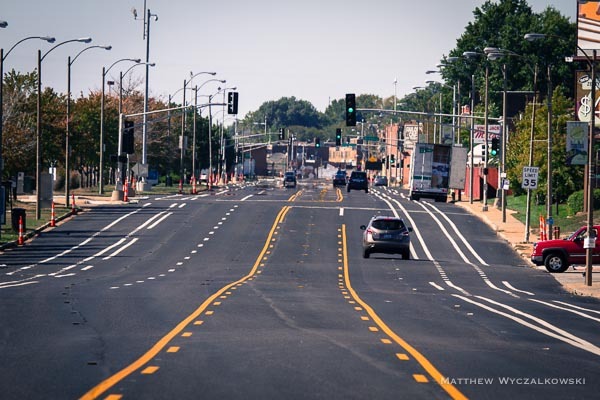 We rode the new lanes on Manchester a few times on a Sunday afternoon, and share photos and a few thoughts below. The section in The Grove district seems well done, even though there are few dedicated bike lanes on this busy and narrow stretch. The bike lanes between Kingshighway and McCausland, on the other hand, are inconsistent and confusing, and most worryingly are altogether absent from a significant stretch in the eastbound direction. 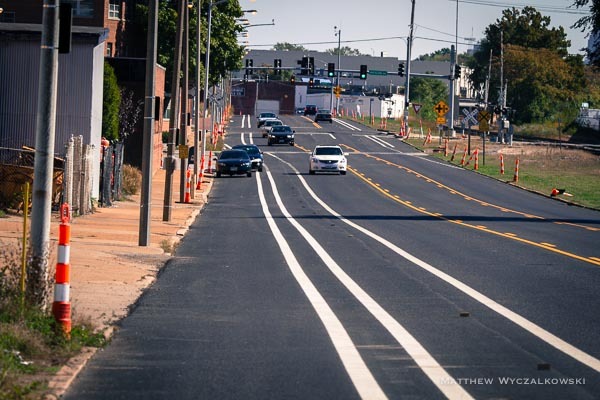 Incorporating bicycle facilities into this major east-west corridor is a welcome gesture, but the ill considered design does not serve cyclists well and represents a lost opportunity to significantly improve St. Louis bicycle infrastructure. Manchester westbound near Tower Grove Ave, with Kingshighway intersection visible in distance. 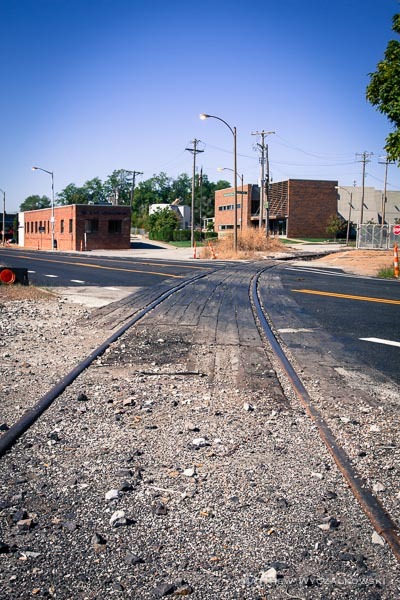 This layout is fairly representative of the configuration in the Grove district from Kingshighway to Vandeventer. Parking is interspersed with turn lanes, and the single lane carries shared car and bicycle traffic. A half-block of eastbound bike lanes near Kingshighway is visible, but the westbound bike lanes described in the public plan have not been striped (thanks to @GatewayStreets for the observation). Manchester Ave eastbound near East Street. 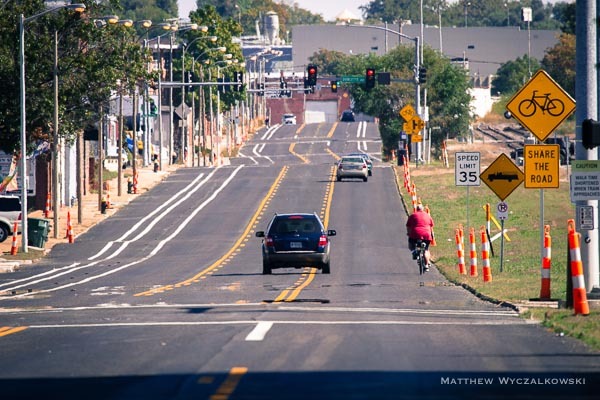 Bike lanes are against the curb, and are separated from automobile traffic with a narrow buffer lane in most places. Manchester near West Park looking east. On-street parking begins on westbound Manchester past Macklind, and the westbound bike lane shifts left. The narrow buffer lane is now on the right side of the bike lane. Manchester at Dale looking west. 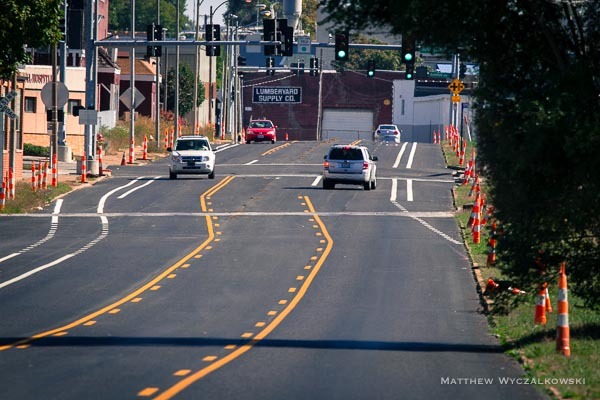 From Dale to McCausland there are two narrow buffer lanes on each side of the bike lane. The eastbound bike lane has a buffer lane on the left. Riding back towards Kingshighway, photo Manchester near Mitchell facing east. 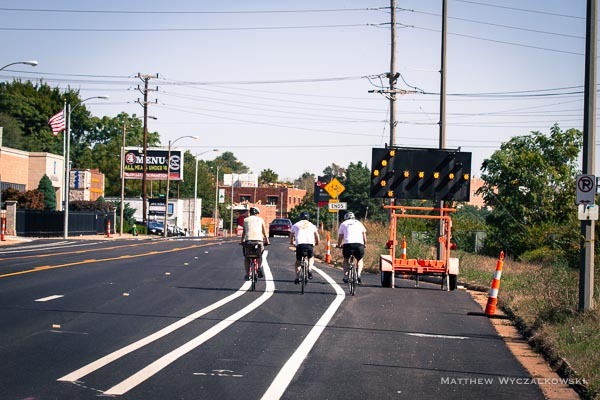 The eastbound bike lanes end near Dale, and bicycles must merge with two lanes of car traffic. Manchester at Hampton looking east. For over a mile from Dale to Macklind, the single eastbound carries shared bicycle and car traffic. Cars must use the left turn lane to pass. Manchester near West Park looking east. Near Macklind the eastbound bike lane resumes again to Kingsighway, and a little beyond into the Grove. 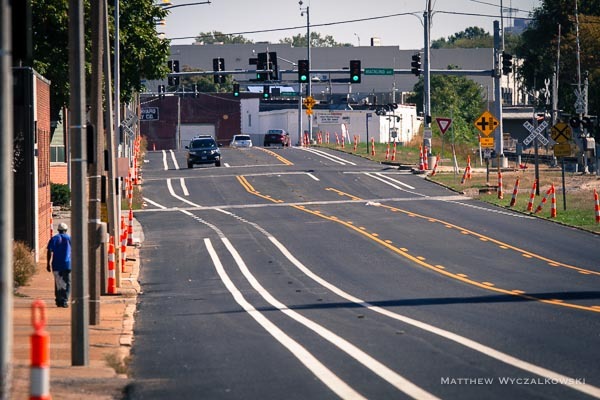 A major problem is the disappearance of eastbound bike lanes for a mile-long stretch between Dale and Macklind, even while westbound lanes are uninterrupted. This is inconsistent and confusing, and for many riders, a lack of continuous bike lanes will be a major barrier to riding along the road. Eastbound bike lanes disappear where westbound on-street parking is permitted. We saw very little demand for parking along this entire stretch, and the eastbound car lane and center turn lanes are unusually wide. This layout seems driven by competition for limited roadway space between drivers, cyclists, and parking, and here it is obvious cyclists lost. In places the lane layout is very confusing. With little parking and incomplete signage, it is not always clear what all the lanes are for. 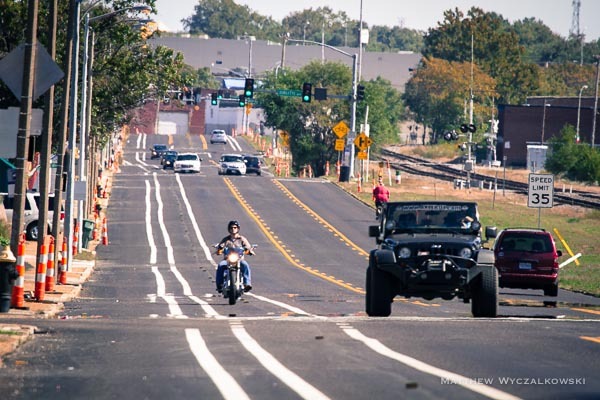 Here, a motorcyclist is riding in the bike lane. Painted bike lane arrows and diagonal lines on the buffer lanes will help, but increased signage emphasizing the bike lanes would also be helpful. A significant and ongoing problem are the railroad tracks immediately west of Macklind. They cross Manchester at an oblique angle, a particularly hazardous situation in the single shared eastbound lane. Other cyclists have also noted this problem. 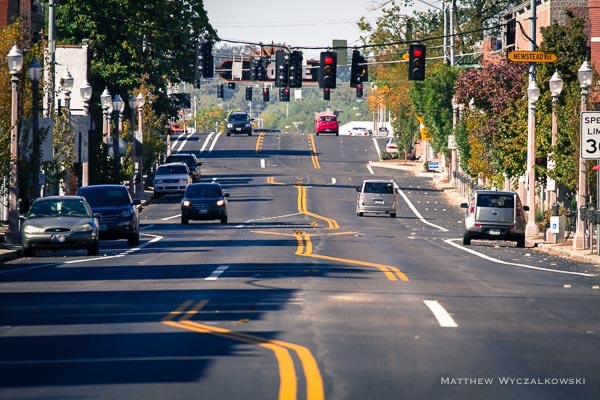 Thanks for posting what appears to be a very comprehensive review of the restriping changes made by MoDOT to Manchester Rd. (Route 100) following its resurfacing. I’m personally not in favor of bike lanes, preferring to leave it to the cyclist when and where to control or share the travel lane. 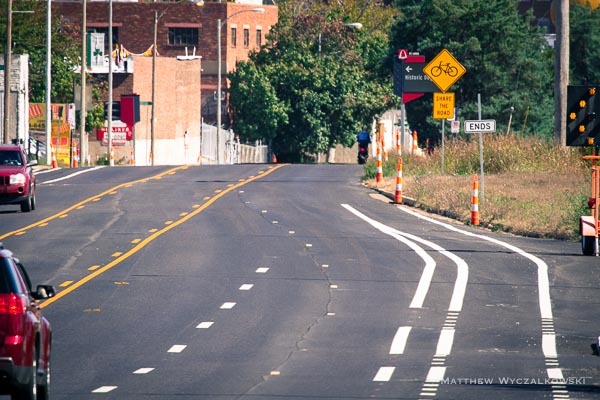 However, I’ll reserve judgement until I actually bike this restriped section. Biked westbound today for the first time. About me: intermediate cyclist who bike commutes to work about 50 times per year. “Fair weather cyclist.” I thought it was a huge improvement. I had given up on taking Manchester home from SLU, but now with the Grand viaduct improvements and the Manchester bike lines, this will probably become my route of choice — westbound to Maplewood. Eastbound looks a disaster, and I’ll continue my workaround up Bellevue through Forest Park rather than trying that. Biggest problem westbound was ending of bike lane a few blocks before Macausland. That’s a tough merge for any but the most experienced and/or bravest cyclists, especially during rush hour. Also had an impromptu taxi stand blocking bike lane near Failoni’s, but presumably only a problem today (St. Patrick’s Day). Thanks for your review! Without it, I never would have tried Manchester again. With it, I knew to try westbound first.